Recent years have seen a steady uptick of scholarly interest in the cultural production under Chinese socialism prior to the “reform and opening up.”  These works have assumed the task not merely of filling us in on the literary history between 1949 and 1976, but also of elucidating different models of aesthetics and cultural production that seem alien to Western liberal sensibilities. Rather than excoriating politicized art as lacking any enduring, humanistic aesthetic value, these studies have instead attempted to explain the different premises underlying artistic production in the People’s Republic of China. Moreover, these works have exerted great impact on scholars working on and teaching about the cultural history of this era, because they allow us to explain to both undergraduate and graduate students how and why artists, officials, and critics in the PRC acted the ways they did. The notion that Chinese socialist literature was merely an ideological tool through which an authoritarian state sought to indoctrinate its populace is simply inadequate for a productive understanding of the period. Such literature was not monolithic, but had many variations that coursed over decades. Socialist aesthetics was firmly embedded within debates about the relation between art and politics, and part of an ongoing response to questions posed since the late-Qing era about how aesthetics could intervene in anti-imperialist resistance and nation building. More than any other literary movement in twentieth century China, socialist cultural production affirmed the power of aesthetics in developing the spiritual and sensorial capabilities of the men and women confronting the challenges of global modernity. But as in other aesthetic regimes closely integrated with the exercise of political authority, writers under PRC socialism found themselves just as—if not more—vulnerable to the harsh and fickle winds of political change. Socialist aesthetics in the PRC was also tied to global attempts to forge a politicized artistic practice, in particular those influenced by the policy of the USSR; it is well known that many PRC literary figures read Soviet literature and theory and/or studied in the USSR. But as recent work from Mark Gamsa reminds us, Chinese writers and critics also read and engaged with 19th century Russian realist criticism, in particular the work of Vissarion Belinsky, Nikolai Dobroliubov, and Nikolai Chernyshevsky. These Russian critics expanded on the Romantic notion of literature expressing national spirit, and focused on how literature can become the quintessential expression of the “people,” that seemingly magical category from which modern political sovereignty should derive. A literature that both represented and emanated from the “people” could not help but be tied to issues of democratic representation and authority. Communist regimes have frequently been criticized for engaging in “social engineering” in an attempt to wholly remake the human personality, often over and against some predetermined notion of “human nature.” But when it comes to aesthetics, it is hard not to see what the socialists were doing as a kind of “engineering.” They recognized the power of aesthetics in molding sensorial experience and held such power in great esteem. The state’s sponsorship of and control over aesthetics was part and parcel of a greater bio-political project in the management of populations and in the cultivation of an experiential common sense that would prove amenable to the nation’s political goals. 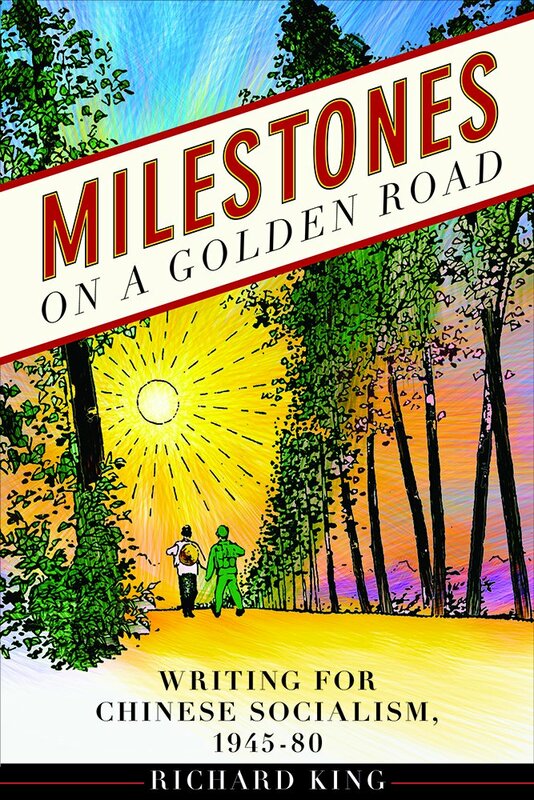 Richard King’s Milestones on a Golden Road: Writing for Chinese Socialism is a wonderful contribution to our expanding understanding of the socialist aesthetic experience. His book consists of case studies of works from different phases of socialist literary history and details the corresponding changes in priorities and policies with which writers contended in each of these periods. Moreover, the book is enriched by King’s interviews with many of the authors he examines. While King acknowledges that retrospective memory is itself subject to fabrication, such oral material helps bring these often obscured writers to life and gives us some sense of these writers’ agency. 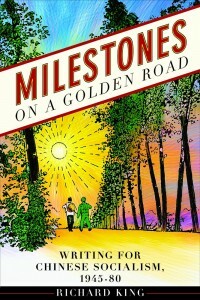 The “Golden Road” in King’s title is a direct nod to Hao Ran’s novel of the same name, the subject of one of his case studies (“golden road” a well-worn metaphor for socialism’s utopian aspirations). Writing for socialism was meant to encourage progress on the road to an alternative modernity free from colonial interference and cultural stagnation; but as King reminds us in his concluding notes, the CCP’s monumental effort to create socialist modernity was ultimately a “road to nowhere” (209). As such, the book is marked by a tone of wistfulness; the futility of the whole enterprise was not only confirmed by the purges, famines, and turmoil of the Mao era, but also by the seemingly misplaced hopes of the writers, many of whom seemed genuine in their desire to participate in building socialism. The book is divided into four parts with an introduction and epilogue. Each part is devoted to a particular period: the Civil War (1945-1948), The Great Leap Period (1959-1962), the Cultural Revolution (1972-1976), and the immediate post-Mao era (1979-1980). Moreover, each part is comprised of two chapters, each of which examines a particular novel or short story. Part 1 investigates how writers in the years immediately before the establishment of the PRC sought to incorporate the recently formulated literary doctrines codified in Yan’an in their attempt to produce new “mass forms.” In chapter 1, King explains how Ma Feng and Xi Rong’s Heroes of Lüliang (published in serialized form in the mid-1940s) actively reworked folk traditions, much in the style of Ming novels such as Shuihu zhuan, in an effort to produce a lively narrative that would appeal to non-urban readers. In contrast, chapter 2 details how Hurricane (1948) reflects Zhou Libo’s attempt to produce a novel that would import Soviet norms of Socialist Realism onto Chinese literary soil. The artistic campaigns that accompanied the Great Leap Forward are examined in Part 2. King offers a reading of Li Zhun’s “A Brief Biography of Li Shuangshuang” (1959), the well-known tale of how a half-literate peasant woman becomes a leader of her village during the Great Leap Forward and frees herself from the shackles of gender oppression and domestic chores. A paragon of new socialist womanhood, Li Shuangshuang, King argues, also has origins in the virago character that appears in traditional bianwen texts dating from the Tang period. In his discussion of Li Zhun, King rhetorically muses on how writers who were well aware of the deficiencies of socialism could nevertheless write glorious portrayals of mass canteens filled with abundant food when real peasants were starving (90-91). To what extent were writers cynically falling for the Party line, or were they fatuously gullible and thus blind to the more desperate reality of the places and people they were ostensibly depicting? King offers no definitive answer, and this seems perhaps closer to the truth —the motivations that led a writer to produce such patently false propaganda were a complex combination of authoritarian pressures, self-deception, professional careerism, and a good dose of genuine hope that the images of abundance one was proffering would indeed come to fruition. If Li Zhun’s famous tale (also made into a well known movie) upheld the heroic potential of women in spurring on collective production targets, then the subject of the second case study, Hu Wanchun’s story “A Man of Outstanding Quality” (1959) offers a glimpse of the masculine industrial hero built in the mode of Nikolai Ostrovsky’s famous hero Pavel Korchagin from his 1936 How the Steel Was Tempered. King argues that Hu Wanchun’s protagonist, the steely Wang Gang (王刚), was an attempt to write a “positive hero” (polozhitel’nyi geroi) in the Soviet mode; in contrast to the passive, effete superfluous heroes of nineteenth-century Russian literature, the “positive hero” was distinguished by his ability to act upon the world and transform it. The Great Leap Forward, the most extreme political manifestation of the voluntaristic conviction that humans could transfigure their world, found an apposite literary model in the “positive hero” Wang Gang. The Cultural Revolution’s hyperbolic ideological assault on the senses—the tail end of the “golden road” before it finally petered out—is the subject of Part 3. As King argues, this period constitutes the climax of Chinese socialist fiction in terms of ideological “tendentiousness,” a dramatic and tragic apotheosis that would quickly thereafter be “washed away by the flood of tears in the post-Mao catharsis of the 1970s” (113). In this section King discusses Hao Ran’s epic celebration of 1950s land reform, The Golden Road (the first two [of four] volumes of which were published in 1972 and 1974), and Zhang Kangkang’s heroic narration of sent-down youth revolutionizing the countryside, The Dividing Line (1975). In both of these tales, the mythologized depiction of larger-than-life heroes seemed to borrow from earlier socialist celebrations of model types, but, as King argues, these heroes’ greatly exaggerated capacities seemed more appropriate to supernatural beings than humans. Drawing on Joseph Campbell’s description in The Power of Myth, King offers an interesting discussion of Hao Ran’s protagonist, Gao Daquan, suggesting that the protagonist embarks on a journey of glory like those found in traditional mythological lore (121). Adding to King’s analysis, I would suggest using Vladimir Propp’s Morphology of the Folktale, which can help us identify the means by which a distinctive “master plot” (of Chinese socialist fiction) undergoes diachronic variation. King devotes his final section to fiction written after the death of Mao. Chen Guokai’s “scar” novel, The Price (1980), and Zhang Yigong’s revisionist depiction of the Great Leap Forward, The Story of the Criminal Li Tongzhong (1980), are literary attempts to take account of what actually happened during the socialist era. As King notes, these stories adopt the conventions of socialist literature in the effort to expose historical failures rather than glorify fictitious accomplishments (197). Such literature exhausted the formal possibilities of socialist conventions, and very different literary models, particularly Western modernism, would soon come to dominate as sources of creative inspiration. King is to be commended for his clear, meticulous explication of the works he analyzes, as well as of their authors and their historical circumstances. Its chronological organization, taking us from the pre-PRC years into early 1980s reform era, provides a broad canvas on which to visualize and ruminate on the socialist era of literary production as a whole. Some parts of the book could have benefitted from more theoretical scrutiny; although King’s familiarity with this literature is evident, he could perhaps have drawn more from literary/cultural theory to provide even tighter analyses of his chosen works. But as a much needed, clear-eyed introduction to the various phases of socialist fiction, this book will serve as an important resource for both teachers and scholars of the Chinese socialist era. Moreover, as we in the present confront a very different “total aesthetics” of late capitalism, King’s examination of failed aesthetic experiments from the socialist past may provide a crucial space for reflecting more critically on our contemporary situation. For examples of recent books, see Wendy Larson, From Ah-Q to Lei Feng: Freud and Revolutionary Spirit in 20th Century China (Stanford: Stanford UP, 2009); Peter Button, Configurations of the Real in Chinese Literary and Aesthetic Modernity (Leiden: Brill, 2009); Krista Van Fleit Hang, Literature the People Love: Reading Literature in the Early Maoist Period (1949-1966) (New York: Palgrave Macmillan, 2013); Barbara Mittler, A Continuous Revolution: Making Sense of Cultural Revolution Culture (Cambridge, MA: Harvard Asia Center Publications, 2012); Alexander Cook, ed. Mao’s Little Red Book: A Global History (Cambridge: Cambridge University Press, 2014). Mark Gamsa, The Reading of Russian Literature in China: A Moral Example and Manual of Practice (New York: Palgrave Macmillan, 2010), 29. (See MCLC Resource Center Publication review, September 2012. Readers should note that King has edited translations of “The Story of Li Shuangshuang” and The Story of Criminal Li Tongzhong together as a single volume; as with Milestones on a Golden Road, King’s translations have already been of enormous pedagogical benefit to me. See King, ed. Heroes of China’s Great Leap Forward: Two Stories (Honolulu: University of Hawai’i Press, 2010).